Crochet Dress-Bonnet-Shoes. A free crochet pattern to fit approx a 0-3 month baby, made in UK double knitting or USA worsted weight #3 yarn on 3.50mm, 4.00mm & 4.50mm crochet hooks. Crochet baby glitz booties uk, a free crochet pattern to fit approx a 0-3 month baby, made in a UK double knitting glitz yarn on 5.00mm and 4.00mm crochet hooks. Pair up with my baby glitz coat and hat to make a delightful set. Using 5.00mm hook make 27ch, ss to first ch to make a ring. Change to 4.00mm hook, work 1ch, (RS) 1dc into base of 1ch, 1dc into each ch to end, ss to first dc on beginning row (27dc). Turn. 2nd Row – 1ch, 1dc into base of 1ch, 1dc into each dc to end, ss to first dc on beginning of row. Turn. Rpt 2nd Row until 9 rows have been worked in all. Fasten off. Turn. Next row – 1ch, 1dc into base of 1ch, 1dc into each of next 8dc. Turn. Rpt last row until 9 rows have been worked in all. Fasten off. Turn. Row 2 – Make 1ch, 1dc into base of 1ch, 1dc into each dc to end, ss to first dc. Turn. Row 3 – Rpt Row 2 once. Turn. Row 5 – Rpt Row 2. With WS of bootie facing, make 1ch, ss loosely through centre loops of the dc’s to close gap on sole of bootie. Fasten off. Pattern Row 2 – 1ch, ss into base of 1ch, * 1tr, into next htr, ss into next htr, * rpt from * to * to last htr, 1tr into htr, ss to first ss on beginning of row. Turn. Rpt Pattern Rows 1 & 2 twice each. Fasten off. 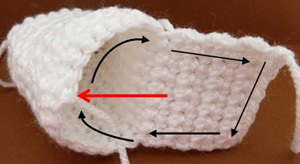 Turn through to RS, fold cuff over onto RS (from where you worked into front loop), attach a button to side of cuff on each bootie. 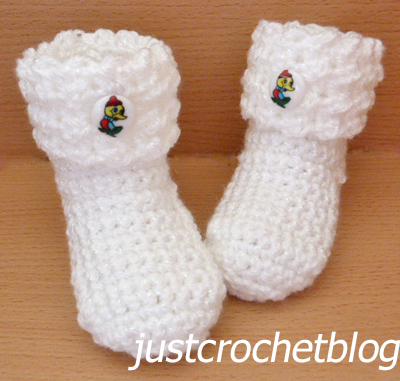 Hope you enjoy this free crochet baby glitz booties uk pattern, don’t forget to pin! All pattern sizing, yarn weights, gauges etc are approximate. but I am only human so mistakes may be made, if you find one please let me know. please give credit to justcrochet as the designer and put a link back to this website. 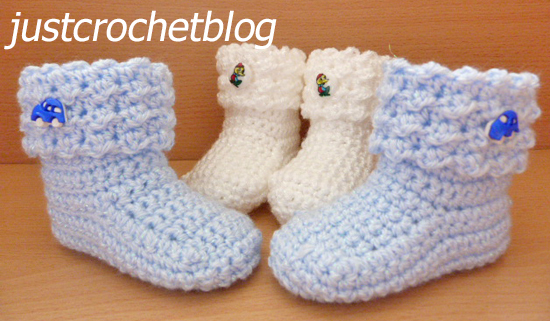 Crochet baby glitz booties, a free crochet pattern to fit approx a 0-3 month baby, made in a worsted weight #3 yarn on 5.00mm and 4.00mm crochet hooks. 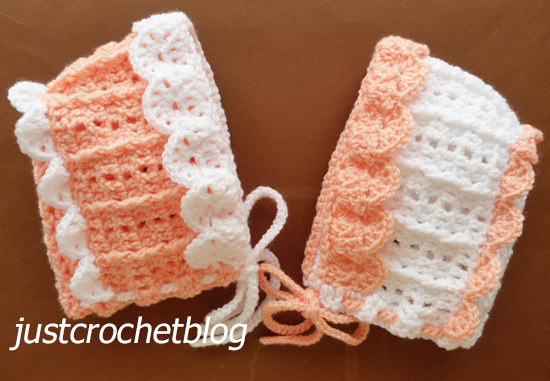 A Pretty Crochet Bonnet – free crochet pattern for a 0-3 month baby, made in a worsted weight #3 yarn on a 3.50mm crochet hook. 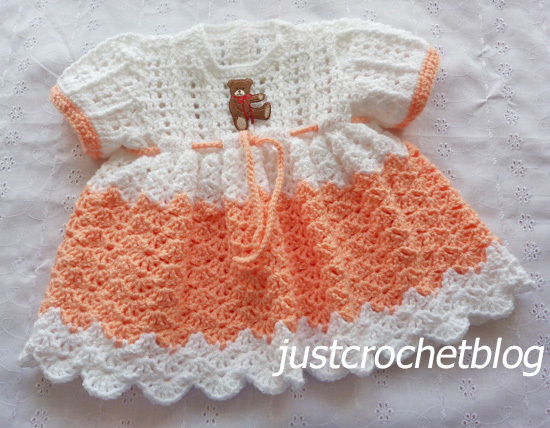 A Pretty Crochet Dress – free crochet pattern for a 16″ chest 0-3 month baby, made in a worsted weight #3 yarn on 3.50mm, 4.00mm & 4.50mm crochet hooks.